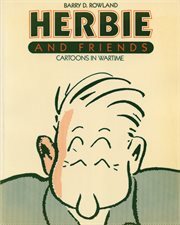 The item Herbie and friends : cartoons in wartime, Barry D. Rowland, (electronic resource) represents a specific, individual, material embodiment of a distinct intellectual or artistic creation found in Richland Library. Clearly the favourite character of Canada's overseas troops during World War II, "Herbie" had a penchant for getting into some of the most bizarre predicaments imaginable. With feet that generally led to trouble and a nose like a disillusioned banana, Herbie provided Canadian soldiers with a daily ration of laughter at a time when humour was often at a premium. No figure before or since boosted so effectively the spirit of Canadians overseas. As J.D. MacFarlane, Editor of The Maple Leaf, stated so aptly: "War can be funny as hell. Things happen to soldiers that shoudn't happen to a human - crazy situations that add touches of humour to an otherwise grim business ... Herbie helped to win the war with laughs."